Spending some time on the east bank of Luxor will bring you quite some joy. You can go on your own or go with a qualified Egyptologists guide on a private tour exploring the two most impressive temples in Upper Egypt: the Luxor Temple and the Karnak Temple complex. Of course there is much more to see on the east bank of Luxor. Some of the sights you find below. If you want to come with a group, you can choose what you want to put in your own travel program. We are at your service to advice you for these sights or other possibilities. Luxor Temple is huge in scale. It once housed a village within its walls. The temple is situated in the heart of Luxor and is a magnificent example of Egypt’s ancient structural and architectural temple art. The temple is dedicated to Amun, a creator God often fused with the Sun God Ra into Amun-Ra. The core of the temple was built by Amenhotep 3 in the 14th century BCE. Akhenaten obliterated his father’s cartouches and installed a shrine to the Aten. Tutankhamun and Horemheb added columns, statues and friezes. However, the only major expansion effort took place under Ramses 2 (1279 – 1212), some 100 years after the first stones were put in place. This is the construction as we see it now. This makes the Luxor Temple unique among the main Egyptian temple complexes in having only two pharaohs leave their mark on its architectural structure. Built in the 13th century amid the ruins of Luxor Temple, the Abu el Haggag Mosque has been left intact because of its religious and historical significance. 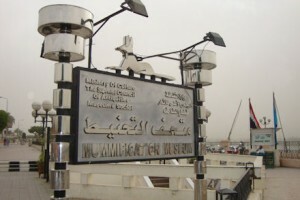 Yusuf el Haggag was a Sufi sheik, known as the Father of the Pilgrimage. He was born in Damascus around 1150 AD and moved to Mecca in his forties, before he finally settled in Luxor. He died in 1243, but it is believed that the minaret is older than he was, dating back to the 11th century. The mosque itself has been rebuilt many times and completely in the 19th century. 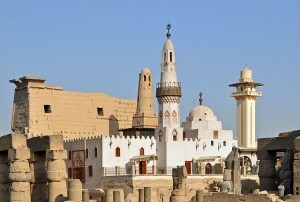 The Abu Haggag Mosque is Luxor’s oldest mosque and Abu el Haggag is Luxor’s main saint. Lots of people claimed that he became a monk and was given a power to practice miracles, such as walking on water, healing rare diseases, and even people see him in the pilgrimage in Saudi Arabia while others sees him at the same time in Luxor. When he died he was buried in the mosque. He is honoured every year during the Abu el Haggag Festival, two weeks before the start of Ramadan. 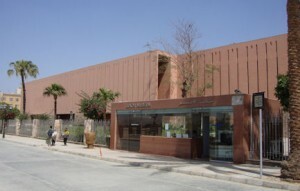 This modern, elegant and extremely spacious museum, built along the Nile, houses a large collection of tremendously significant objects: impressive artworks, pottery, furniture and important archaeological finds from the Theban temples and necropolis on the West Bank dating from the Pre-dynastic Period right through to the Islamic era. The Luxor Museum is surprisingly entertaining and a perfect place to spend a hot morning in Luxor. The Mummification Museum has everything you’ve ever wanted to know about mummies and the process of mummification. The modern purpose built museum consists of only one room and still provides you with an overall picture of the mummification procedure and the rituals connected to it. Well-lit and beautifully displayed exhibits and story boards describe the process of mummification from the beginning to the end, as well as the religious customs associated with burials. The purpose of mummification in ancient Egypt was to preserve the body of the deceased so that they could dwell in the afterlife, in the realm of the gods. There is also a collection of well-preserved mummy-cases, mostly from Upper Egypt, as there are also animal mummies, including a crocodile, a cat and a ram. During the digging season in wintertime international archaeologists and Egyptologists give lectures by explaining their work. Sometimes by chance other foreign guests in Luxor are invited to give lectures in other interesting subjects. Ancient Egyptian temples were considered to be the residence of the god. 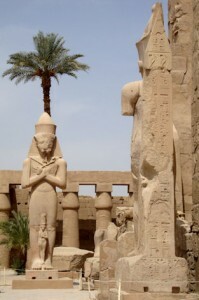 So, the impressive Karnak Temple was the dwelling place of the Theban triad of Amun, his wife Mut and their son Khonsu. Each of them had an area in the temple complex, the greatest and largest belonging to Amun. There was also a precinct for Monthu, the falcon-headed local god of Thebe. 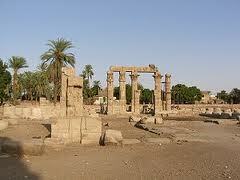 Karnak is the biggest temple complex in the world, covering an area of 100 hectares. The huge temple complex was built over 2000 years. Around 30 successive pharaohs added their own touches to the complex: a new temple, shrine, or pylon and carved detailed hieroglyphic inscriptions. There are over 25 temples and chapels in the complex, including separate shrines for the three boats that took the statues of the gods on their annual trip on the flooding Nile. Sanctuaries, obelisks, and groups of columns all feature accounts of the heroic deeds of the sponsoring pharaoh. The Karnak complex includes several of the finest examples of ancient Egyptian design and architecture. Among them is the Hypostyle Hall, considered one of the world’s great architectural achievements. It is filled with 134 enormous pillars, the highest 21,3 m tall, and each about 13,7 m around. The hall covers an area of 19,7 sq m.
The most spectacular of the temples at Karnak is the Temple of Amun, which was known during the Middle Kingdom period as Ipet-Isut (the Most Select (or Sacred) of Places). It was also called Pr-Imn (House of Amun). The Temple of Amun is entered via the Avenue of Sphinxes, or the Sacred Way, that once stretched the 3 km from Karnak to Luxor Temple. There are 20 rams on each side, extending from the small harbour to the 1st Pylon, which was built during the time of King Nektanebo 1 (30th Dynasty). As you cross this pylon, it takes you into an open court, whose dimensions are 100 m long by 80 m wide, built during the 22nd Dynasty, and containing rows of bud papyrus columns. 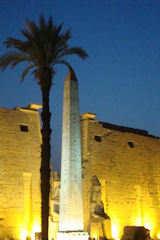 The Obelisk of Thutmose 1, a 22 m monument, is the only one of four original obelisks that is still standing. The temple was a closed compound, open only to the priests and the pharaoh. The common people could only enter the courtyard. A 20 m high, mud brick enclosure wall, surrounded all of these buildings. The history of Karnak Temple and its gods is told in three performances in different languages each evening in a spectacular Sound and Light Show. To use a horse carriage, called ‘calèches’, is one of the most atmospheric ways of travelling in Luxor. The horse-drawn carriages are common on the east bank and are a delightful way to see the city. Prices vary according to bargaining skill. 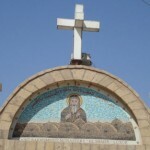 About 7 km north of Luxor you’ll find the Coptic Christian Monastery of Deir el Shayeb or the ‘elderly man’s monastery, in remembrance of the saint’s apparition to an elder as a venerable old man. It is dedicated to the Saint Bakhomious. It contains three chapels plus rooms used for baptismal purposes. Coptic writing and crosses adorn the walls. Monthu was a falcon-headed god whose origins date back to the Old Kingdom. During Dynasty XI the god achieved the status of patron of the Theban kings and became associated with war. 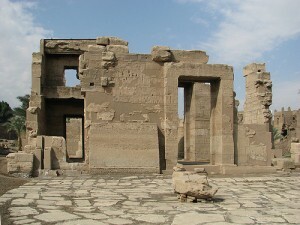 The Temple of Monthu is located 8 km northeast of Karnak. This temple replaced an ancient sanctuary and consists of an open forum with a tower and enclosing two mounds that housed the chapels of worship. It is thought that original sanctuary dates to the Old Kingdom. The ruins of the last structure date to the Ptolemy 8 period of the 2nd century BCE, although decorations and additions continued to be added centuries later by the Romans. Because of Monthu’s strong association with raging bulls, the temple was a major centre of worship for bulls, containing many statues of bulls for worship and reliefs. Most of these statues are now located in various museums around the world. You’ll find this roman Temple of Isis 20 km away from Luxor city. The name of the temple literally means ‘The Lake of Horus’. However, it is a mysterious name, as there is no evidence of a lake or water feature here. 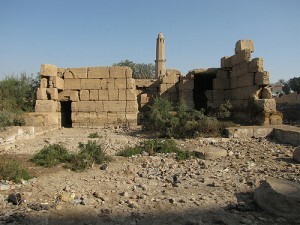 The site is located behind Sheik’s Tomb and Mamluke’s Mosque. The temple hides something special. Behind the doorway temple two secret rooms where built into the thickness of the wall. On both sides, a moveable block could be rolled on small wheels, which revealed an opening two steps down into the crypt. Emperor Augustus built the earliest part i.e. the northern part of the temple. This part is home to central sanctuary, door jambs and vestibule. The Temple of the falcon-headed god Monthu at Tod, just about 15 km south of Luxor, has quite a few surprises, but not surprisingly the ancient god Monthu is featured frequently. Evidence shows that a 5th dynasty structure was built on the site, along with major temples during the 12th dynasty. Surviving architectural remains date to the reigns of Tuthmosis 3 and Ramses 3 and 4, Ptolemy 8, and the Roman period. The picturesque nature of the ruins and the quietness of the site makes a visit to Tod a unique experience. In the 1930′s four copper chests were discovered and found to be filled with mostly silver objects but also lapis lazuli, and a little gold. These were the property of the 12th dynasty pharaoh Amenemhet 2. This is known as the ’Tod Treasure’ which is now split between the Egyptian Museum in Cairo, and the Louvre in Paris.